Throwing baby showers is just a little bit harder than throwing a birthday party solely because of the theme. Of course, with birthday parties, you already know if it’s a boy or a girl who will be celebrating for. With baby showers, you have to either risk a gender-friendly themed design or a neutral but personalized baby shower. The safest way to go about it is the second method, because there are several baby shower themes that you can choose from that still gives a neutral vibe without taking out the fun in color schemes, centerpieces, and decoration. One of these themes is an owl themed baby shower. You think that it would be hard to come up with a good design and set-up for a theme that revolves on just one bird—and one that is commonly brown in color. In fact, anything owl related may be a hardball to pull off, especially with the way you seem to be limited with the color, invitation designs, cake samples, and decoration. But when it comes to owl themed baby showers, you have to remember that all of the designs are open for interpretation. And you can easily make owls into fun characters for a create a personalized baby shower. 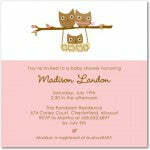 You can start with owl themed baby shower invitations to get the process started. The next thing to remember when it comes to owl themed baby showers is that you need to decide on the main colors and design of the theme. Since it is a baby shower, it is much better to use owls that have big cute eyes and colorful feathers, so that your baby shower will have a nice festive feel to it. Brown has always been a staple color when it comes to realistic owls, but let’s face it—this is a baby shower, and you’re not restricted by realism or art. What you want is to make the decorations and color scheme fitting to a joyous occasion. As for the owl decoration that you will use, opt for those that look like they’re straight from a cartoon. You can easily create your own cartoon owl characters. The good thing about going with a cartoon owl is that you will lessen the notion that owls are serious creatures, hence the correlation of the party having a stiff atmosphere. You can go with pastel colors to make a variety of owls, or go with just two to three major colors which you can mix and match and use for the colors of your utensils, decorations, and other supplies. Now that you have decided on the main color of your party theme, it’s time that you worry about the centerpiece of the show. Similar to birthday parties, it is also fun to have a nice cake centerpiece. If you already have a menu, you don’t have to revamp the ideas just because you have an owl theme. Bear in mind that a theme usually adds decoration. To unify the theme, just add accessories and a small paper mache owl on the glass rim. On the table, you can put in owl toy plushies or have those festive banner cut-outs in the shape of owls. When it comes to your centerpiece, it would be nice if you can have your cake personalized and made to look like a cartoon owl. In a previous blog post we showed an example of our owl diaper cake that uses a very colorful and baby shower friendly plush owl that certainly can be used as a baby shower centerpiece if you don’t want to use an edible cake. If you prefer an edible cake, there are many stores that accept cake orders. Tell them specifically what kind of color and shade you will need and what design you would need to have on the cake. You can choose to go with just a picture of an owl on the flat surface or an entirely creative cake that’s part edible, part artwork. For those who want a different kind of centerpiece tiny owl cupcakes or owl cookies are adorable and they can be a unique way to decorate your table. You can use food coloring to match your cookies with your color scheme but still maintain the flavors that you want. To make them look like owls, you can use whipped cream and little chocolate bits for the eyes—just pop them in the oven for a few minutes. For a more creative approach, use your art skills to put owl eyes on the colorful balloons. Add plumes which you can buy cheaply in bulks. These plumes can be side decorations on the table or they can be attached to the string of the balloons to make a more snazzy-looking owl balloons. Another important thing that you should not forget with baby showers would be the baby shower favors. Some of the common baby shower favors are figurines or small cupcakes that can be the perfect and dainty token for your guests. However, since you’re already going with an owl theme, it is best to use that theme until the end, even for your baby shower favors. You can use some of the owl cookies or cupcakes as a nice token. Just remember to wrap them in nice packages. Or you can also opt to go with finding a cheap owl figurine that goes well with your overall scheme. This way, it will show that you have planned the perfect baby shower because you took everything into consideration. All of these ideas seem easy to execute, but if you’re on a tight budget, it may need a little tweaking. For instance, instead of ordering a cake, why not try creating your own cake? If you have an oven at home, you can easily whip up your own owl cake—which is better because you can ensure that the icing and cake decors match your overall color scheme. There are several cake designs and recipes on the Internet that you can follow. Just make sure that you follow the recipe or have someone with you while baking. As much as you can, follow the looks for a less designer approach—if you can create your own materials, it makes for a more personalized owl themed baby shower display. I have put together a video buyer’s guide entitled “How to Buy a Diaper Cake”. I did this to create a standalone guide that would help people who are beginning their baby diaper cake or baby gift buying process. In the video I start with a basic definition about what a diaper cake is. We still get emails and phone calls from people innocently asking how many people does of our our newborn diaper cakes feed. Or another popular question is: “Do I have to refrigerate a diaper cake?” We don’t mind responding to these questions, I attribute them to folks not really knowing about diaper cakes and how they are used as baby shower centerpieces or for baby gift giving. I continue on to discuss the types of diaper cakes (layered and folded) as well as a discussion about diapers that are used to make them. Even though I am showing our diaper cakes in the video, the video is not a sales pitch for Lil’ Baby Cakes. Instead, I offer what I feel are practical considerations when buying a newborn diaper cake along with shopping tips about shipping, site security, and diaper cake customization. There are many styles of baby shower diaper cakes and many different places they can be purchased. I also mention eco friendly diaper cakes and diaper cakes made with printed diapers to show the difference between those diapers and Pampers from an appearance perspective. I hope you find the video instructive. Your comments are appreciated and are welcomed. Don’t hesitate to contact us at for assistance on any baby diaper cake question.